Storage is at a premium for many homeowners and landowners these days. If your attached garage or workshop is filled to capacity, it may be time to look into additional storage solutions for your property. 1. Our garages range in size to accommodate almost everything—Need to store lawn equipment, a motorcycle, or just miscellaneous household and outdoor items? Look no further than our 12’x20’ portable garages. But if you need even more space for items as large as boats, cars, and other big-ticket items, we offer garages up to 14’x40’ in size. With 8’ walls, you’ll have no trouble fitting a wide variety of tools, equipment, and vehicles in your new garage. 2. You can choose from wood or metal construction—Our garages are built with two different materials: wood and metal. Choose from the material type that fits your property, your home, your business, and your personal needs. In addition, our garages can also be outfitted with the choice of either wood or shingle roofs to further increase your options and customization choices. 3. Portable garages are the ultimate in convenience and versatility—When we say portable garages, we mean it. 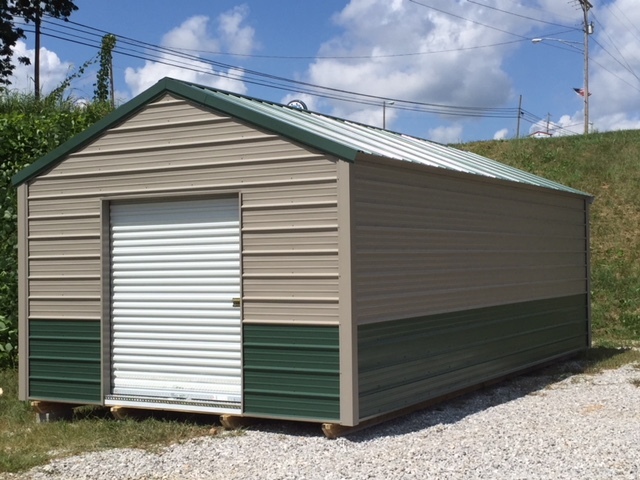 In addition to being built on-site at our facility in Cumberland Furnace, Tennessee, and then transported to your property, our garages are also capable of being moved once they’re on-site. That means you can freely move your garage as your property or your needs expand, change, and grow. 4. You get a 12-month warranty and a satisfaction guarantee—Buying a portable building can be a major investment—especially if you need a big garage to store expensive items. We want to give you peace of mind, and that’s why we offer a 12-month warranty on our portable garages and a satisfaction guarantee. If you’re unhappy with your purchase, get in touch with us and we’ll make it right. 5. Our garages are built by us in Tennessee—If you’re thinking about buying a portable garage, craftsmanship is undoubtedly a big concern. You can rest easy knowing that your garage was built right here in the Volunteer State by our own team of builders. In fact, you can even visit our facility in Cumberland Furnace to see our buildings in person and meet our team. Need a Portable Garage in Tennessee? Call Us Today. We’re ready to take your order. Whether you’re ready to buy a new portable garage outright or enroll in our rent-to-own program, we can help you get the garage that’s right for you. Call us at (615) 789-1030 or complete our online order form.